Teachers can watch video recordings of their lessons as a way to obtain focused feedback on their use of instructional strategies in the classroom. Student survey data can provide focused feedback on how effectively and consistently teachers implement instructional strategies in the classroom. Teachers can use a simple experimental procedure to generate student achievement data that inform focused feedback. Deliberate practice is a critical part of developing teaching expertise. Deliberate practice changes how you store and organize knowledge in your brain. Deliberate practice is easier when feedback is provided by an outside source, like a coach. Growth goals are a key element to becoming a reflective teacher. The skills teachers use in the classroom are causally linked with student achievement. When presenting new content, teachers should be aware of how students will interact with the new knowledge. Focused practice involves repeating a specific strategy with attention to improving detailed aspects of the strategy. When fluency has been fully developed, the reflective teacher both executes the strategy or behavior and monitors its effect. Observing and discussing teaching is an important element to the development of teaching expertise. Student engagement is one element of a lesson segment enacted on the spot. Reflect on this element by asking, "What do I typically do to notice when students are not engaged?" The goal of instructional rounds is for the observing teachers to compare their own practices to the practice of the observed teacher (the focus is not on evaluation). Feedback is essential to determining the success of focused practice, as it tells teachers if their efforts are actually developing expertise. Self-observation using video recordings is a valuable tool that allows a teacher to compare his or her self-expectations with actual performance in the classroom. Research indicates that video data are most beneficial when a teacher focuses on specific elements of instruction. Rather than trying to examine all aspects of a lesson at once, a teacher can purposefully observe the use of particular strategies to gain insight into which aspects still need improvement and which have the desired effect on students. After a teacher reviews video data, he or she can reflect on the recordings and generate ideas for future improvements (pp. 62–63). A teacher can use student survey data to measure students’ reactions and observations in relation to specific instructional strategies. Student surveys may ask students to report how frequently they see a teacher enacting certain behaviors associated with a strategy or ask students for their opinions about a teacher’s employment of a strategy. A teacher can accumulate and reflect on survey data across classrooms in order to decide how the use of a strategy can be adjusted in future lessons (p. 66). When using student achievement data, a teacher can investigate the efficacy of a strategy by comparing the academic growth of two different groups of students. In order to compare students’ growth, a teacher first selects two classes that are learning the same material and then uses the target instructional strategy with only one of those classes. Alternatively, if the aforementioned method is not possible, the teacher can split a class into two groups and use the instructional strategy with only one group. During the unit or lesson, the teacher gives each group the same pretest and posttest in order to calculate students’ average gain scores. A group’s average gain score can be found by subtracting each student’s pretest score from his or her posttest score and averaging the results. While this is not a rigorous statistical treatment of the data, if the group exposed to the strategy has a higher average gain score, it is likely that the strategy positively impacted student learning. A teacher can use this simple experimental structure to test out a number of instructional strategies and to determine which lead to the greatest gains in student growth (pp. 67–69). Practice is typically thought of as working at a skill until one reaches automaticity with it. For example, when people learn to drive, they first learn the basic rules of driving and how to use the various controls on the car. After they have “practiced” these for a period of time, they begin to show more proficiency and can turn, park, stop, and change lanes smoothly. After more repetition, these actions become automatic, easily executed without much mental effort. Deliberate practice differs from this because individuals engaged in deliberate practice tend to resist automaticity. Instead, they consciously focus on specific elements of their performance that still need work or are particularly challenging (pp. 6–7). The practice that experts engage in causes their brains to develop better systems for storing, organizing, and accessing information in their area of expertise. For instance, before cab drivers can be licensed to work in London, they have to pass a test proving they have acquired something called “the knowledge”—an encyclopedic understanding of the streets, hotels, landmarks, tourist attractions, restaurants, parks, theaters, shops, monuments, businesses, and residential areas of London. Research has found that learning this knowledge actually caused a specific part of the cabbies’ brains (the posterior hippocampus) to grow. London cabbies with more experience had larger hippocampuses, suggesting they acquired their facility and skill over time and that it improved with experience and practice (p. 7). Deliberate practice requires a level of metacognition (knowledge about one’s own thinking and performance) that can be difficult to achieve. Therefore, a coach can be very helpful in providing feedback and direction to someone working to develop expertise. A coach is usually someone whose relationship with the individual allows them to give honest and unbiased assessments of the individual’s performance and whose knowledge in the field allows them to choose or design practice activities that will be most effective at helping the subject move to higher and higher levels of skill (p. 8). To establish growth goals, a teacher should conduct a self-audit. This audit should involve a process of self-reflection on strengths and weaknesses within the classroom environment. A self-audit is most powerful when it involves a scale/rubric based on a 0–4 scale that can be charted throughout the academic year (pp. 13–14). A teacher’s pedagogical skill in the classroom can be linked with the quantity and quality of student learning. The relationship between classroom strategies and behaviors and student achievement is very straightforward. The causal relationship between reflective practices and pedagogical skill is not commonly recognized, although the interaction between these elements has been discussed in research for decades (p. 3). Lessons devoted to introducing new content employ a direct instruction approach and take quite a bit of preparation. The teacher must organize the content into small digestible bites. The less students know about the content, the smaller the bites. These bites become the focus of the lesson. Additionally, teachers must identify activities that allow students to preview activities, create interaction, elaborate on the new topic, and reflect on what they have learned (p. 28). In a classroom, this usually means that a teacher selects a specific strategy for practice, along with a specific aspect of that strategy. There are a number of ways that a teacher might focus his or her practice: focusing on specific steps of a strategy, developing a protocol, developing fluency with a strategy, making adaptations to a strategy, or integrating several strategies to create a macrostrategy (p. 49). Fluency means a teacher can perform a strategy or execute a behavior with ease. A fluent teacher is skilled enough with a strategy or behavior to employ it without having to think about the steps involved. For example, a teacher who has selected the previewing strategy K-W-L might find that practicing it three times allows her to feel proficient, and then adds another three sessions to overlearn it. At this point, the teacher knows the strategy so well that she can focus her attention on monitoring students' reactions (pp. 55–56). One way teachers might interact would be to view videos of other teachers. It is useful to determine what was done well by the teacher and what was not. Discussing the effective strategies demonstrated in a video segment, as well as strategies that could have or should have been employed, make almost any video segment a useful vehicle for observing and discussing teaching (pp. 75–77). Consider strategies such as scanning the room, monitoring levels of attention, and periodically asking students to signal their level of attention (pp. 28, 142). Strategies and instructional practices they already use and that they saw others use effectively. Strategies and instructional practices they already use but would like to re-examine or modify based on their observations. Strategies or instructional practices they don't use but will try because they saw others use them effectively (pp. 80–81). There are a number of ways to gather information about continued progress, including reflection logs, video data, student survey data, and student achievement data. 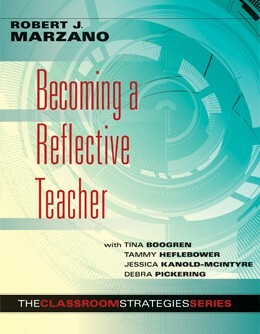 In a reflection log, the teacher records anecdotal comments about his or her performance with a specific strategy. Over time, the teacher will be able to review this log and determine if he or she has made progress (pp. 61–62).